29 September 2018 – Long serving Radio Fox presenter Richard Leatherland has been nominated for the prestigious Caring At Its Best Award 2018. As well as being a Radio Fox volunteer presenter Richard is also a member of UHL staff. The annual Caring At Its Best awards ceremony took place recently and saw over 500 staff, volunteers and supporters of Leicester’s Hospitals enjoy an evening of celebration at The Athena in Leicester. Everyone at the event was interested to hear Richard explain all about how Radio Fox supports the patients within Leicester’s Hospitals. As well as being a presenter at Radio Fox Richard has also served on the committee at the station and been involved with fundraising. The awards are a platform to showcase the hard work of everyone involved in all aspects of Leicester’s Hospitals and to commend the achievements of an extraordinary few. You can listen to Richard live on Radio Fox every Sunday 6pm to 8pm when he hosts The Sunday Selection, the Sunday patients request show. 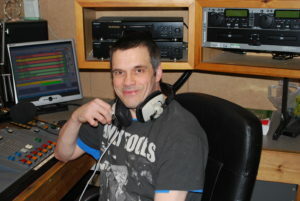 You can also hear Richard live and loud on The Leather & Denim Rock Show every Saturday from 7pm. You can Listen Live to Radio Fox 24 hours a day but did you know you can also Listen Again on our Catch Up service to any of your favourite shows or presenters including Richard.